Combine sun-dried tomatoes, garlic cloves, sugar, salt, and oil in a food processor. Blend until combined, but still slightly coarse. Taste and season as needed. Unfold chilled sheet of puff pastry onto prepared baking sheet. Spread about half the pesto sauce over the puff pastry, leaving a 1/2in border around the edges. (We used all the pesto…oops.) Coarsely tear basil leaves and crumble goat cheese over the sauce. 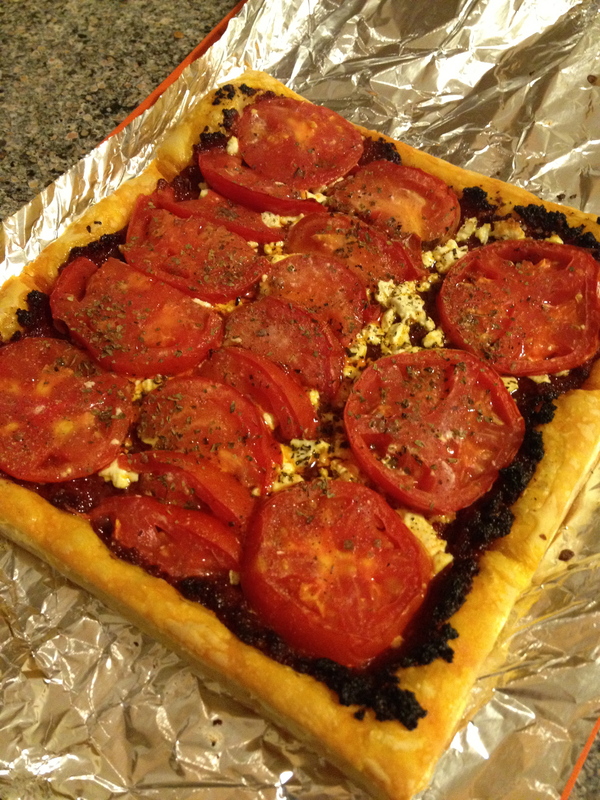 Arrange tomatoes in a single layer over the goat cheese and press down slightly. Try to cover as much pesto as possible as it will burn in the oven as exposed. Sprinkle generously with fresh thyme and drizzle with olive oil. Bake for 15-18 minutes until puffed and golden-brown. Remove from the oven and allow to rest for at least 10 minutes until serving.